This 40th Anniversary volume attempts to constitute the knowledge of Upper Mississippi River System biologists, dedicated to understanding the upper section of the second largest river in the United States. The Mississippi River Research Consortium (MRRC) is a group of river scientists organized in 1968. Approximately 100 members gather annually to present and discuss current Upper Mississippi River System research. This volume commemorates 40 years of the Upper Mississippi River Research Consortium, reflecting platform presentations provided at the 40th MRRC anniversary meeting held at the Grand River Center and the National Mississippi River Museum & Aquarium, April 24–25, 2008, in Dubuque, Iowa. References to the river pools, dams, and tributaries of the Upper Mississippi River System are common throughout this volume. Figure 1, provided in the first article of this volume, “Forty years of science and management on the Upper Mississippi River: an analysis of the past and a view of the future,” by Richard E. Sparks, may be used as a reference for general geographic information of the Upper Mississippi River System. This figure is also available on the Mississippi River Research Consortium website sponsored by The National Great Rivers Research & Education Center (http://www.ngrrec.org/mrrc/). The guest editors would like to thank Georginia Ardinger and Carol Lowenberg, Upper Midwest Environmental Sciences Center, U.S. Geological Survey, for their efforts and dedication toward organizing the review process. We are thankful for our many referees who provided thoughtful and insightful manuscript reviews. 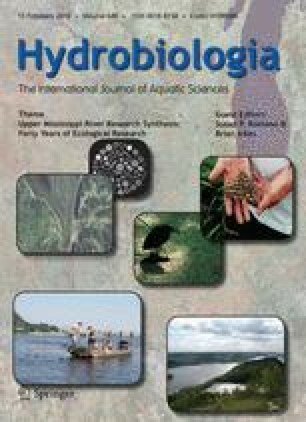 We would also thank the contributing authors for shouldering the monumental task of synthesizing decades of Upper Mississippi River System research.